I had the Indica Vista D90 for a few more hours, and what did i decide to do? Head over to my friend- Yalini's [& her sis] outlet- The Sweet Art. Located in Vadapalani, I had to weave through narrow lanes and crowded streets, all the while wondering if I made the mistake of bringing this car down this road.. But luckily, made it to her store and back home with no scratches or mishaps.. phew! The store is just about a week old and it is cute, yes that is the word that comes to my mind. Small, yet spacious, limited items but lavish enough! Yalini & Suzie - sisters have opened this store, taking their home based business a step ahead. They offer different kinds of cup cakes [eggless & sugar free too], cheese cake, and other desserts as well. I also spotted a few savories, which are from their mom. The simple decor, bright purple wall colour, the interesting little curio items all blended in quite well. The walls were empty, but they dint seem barren. The wall next to the counter was made of black slate sheets and had handwritten menu with pricing. A wash basin is tucked away on the other side of the counter. The Glass walls give the space a grand look. What did I try? 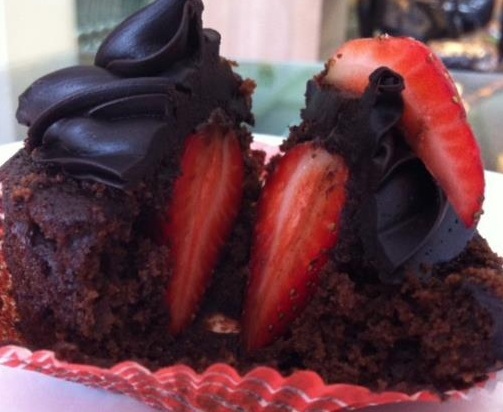 A day ago, Suzie had shared the image of the "love bite", a chocolate cupcake with a fresh strawberry hidden within , chocolate icing and a piece of fresh strawberry. I had it in my mind, and luckily there was one piece left.!! What a treat it was, tucking into the cupcake was just delightful. The strawberry within was so fresh and delish. Enjoyed it. Apart from this, I also got to try Seeni sambal [hope i got the name right] that Yalini's mom brought to the store. It resembled a samosa [semi circle shaped] with fried onion filling, the other one had veggies within. Aunty said they make it with meat as well. She mentioned she had just made a batch of Brinjal pickle which Yalini mentioned would be part of her offering at the Home Bakers guild. Spent some time yakking with Yalini, her mom and with her 2nd son as well. Few hours went by, and it was time to leave. Oh, how can I forget to mention the peach tea I had there. The store offers quite a variety of hot teas and coffee as of now. More to come in the days ahead.